Spotify has finally unveiled a new revamp that sees it bring Facebook integration and take a step closer to replacing iTunes on your computer. The first major change is the addition of Spotify Social, which uses Facebook from within the music program to let you share your track choices with buddies. The obvious benefit of this is that people can easily discover what their friends are looking at and listening too, as well as 'subscribing' to the people that you think have the greatest taste (you can easily spot these people: they're wearing sunglasses in their profile picture). Friends online with Facebook and using Spotify Social will be listed at the side of the screen, and clicking in will let you see their profile picture and track listings for easy music stalkage. "We are looking at integrating some parts of the social aspect," he says. "If you think about the problem of how do you browse music – most people approach the problem by looking at genres. I could probably come up with 200 different genres, but I don't really know what 'neoclassical pop' is. What classifies neo-rock or neo-pop? 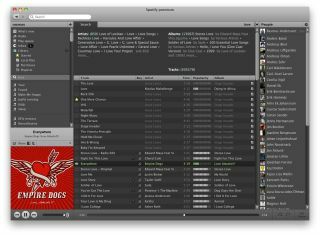 "Spotify is approaching 10 million tracks - how do you browse through 10 million tracks? Searching is one solution but it's not an optimum way of discovering new music. A social aspect is." The other big feature with the new update is the option to import your music files from your computer to the Spotify interface, thus making it much easier to listen to the tracks you want to without having to search for them time and time again. The new update will hit your computer later this week, but if you simply can't wait to try it out, head over to www.spotify.com/download and have a look-see for yourselves.